Direct Boxes may be somewhat of a mystery at first glance. You might also hear the term "DI Boxes" when referring to these. The DI in this case stands for Direct Input or Direct Injection. Also, you'll likely hear the term impedance mismatch when talking about direct boxes and their purpose in the studio setup. But what are they even for?!? Instead of plugging your guitar into an amp then miking the amp to get your signal, you can go direct! I love it when the description of what something does is right there in the name. By electrically mimicking the input circuit from a standard guitar amplifier, these boxes provide a more accurate signal transfer. When I began recording I noticed that my 1/4" Instrument Cable looked like it could be plugged straight into my Mixing Console . While this was technically true, there was a mismatch going on between the signal coming out of my guitar and the signal expected by the inputs of my mixer that I was unaware of. There was no muffled explosion or fire shooting out of my mixer, but the sound quality was leaving something to be desired. What was happening was that since the signals were not matched properly going into my mixer, most of my higher frequencies were not converted and those sounds were lost. I also had to crank up the gain to get a good signal and as a result I was also boosting the noise floor right along with it. Not good Gain Staging practice to say the least. Luckily the solution is a very quick and inexpensive fix. Check out the audio tracks below to hear the difference for yourself. The gain was set with the DI Box in-line, then the inputs were switched to remove the DI Box from the setup. So the gain settings, cables, guitar settings are all the same for both clips, just the Direct Box itself is missing from the 1st example. 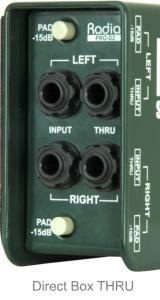 While the input is a standard 1/4" instrument jack, the output is a balanced XLR connection. The signal coming out of that balanced XLR jack needs to be treated in exactly the same way as the weak mic-level signal from a microphone. It will require a mic preamp to boost the signal to a usable level, which can be found on... ding ding ding - your Mixing Console / Audio Interface. So in addition to simulating the circuit within an amp, it also converts your instrument signal to a balanced (low-noise) signal... and minimizing noise here will mean a cleaner signal later. Keyboards Need Direct Boxes Too! When considering a direct box in your home recording studio setup, don't forget about your friend the Digital Piano or Synth! These instruments usually output a strong line level signal, and this can cause headaches because you may actually need to cut (or attenuate for those scientists out there) your input to avoid overloading the preamps. Throw a decent stereo direct box in line and you'll be able to enjoy a fuller dynamic range from your keyboard instruments. For a small investment in a DI box you'll get a much improved and more predictable response from your board when tracking in your studio. As is the case with Studio Monitors, active simply means they are powered by a battery or other external power supply, while passive means that no power is required. So what does an active box get you? Active boxes are great - If you are running long cable or you want the added functionality (such as Equalizers, effects, or additional gain). In general active DI boxes are useful for instruments without an active power source, such as acoustic guitars with Piezo Electric Pickups. 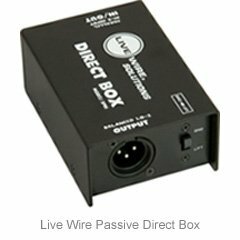 Passive direct boxes come in handy for instruments with preamps on board, such as acoustic electric guitars, or with line level outputs like digital pianos. Another side benefit is that since passive DIs have no power required you don't need to hunt down another outlet or track down additional 9V batteries to make them work. Note that unlike active boxes, it is impossible to over-drive your signal with a passive box since it offers no additional gain. It is encouraging to eliminate at least one possible culprit when the signal clips and the investigation begins on which piece of gear to blame. Both active and passive boxes also are great for eliminating noise in your system due to ground loops and other types of signal interference. 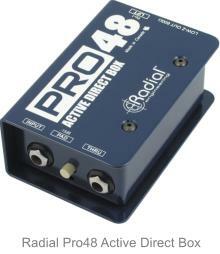 One trick I discovered is to connect a passive Direct Box to the output of my Vocal FX pedal. This has significantly reduced the noise coming from my mic / pedal setup. Now when I crank the preamps on my Audio Interface I don't boost all that unwanted noise along with my signal. The prices on these can range from ~$30-$200. My advice is to try out a middle of the road model and see for yourself the improvement in sound quality. Check out my Direct Box Buying Guide for some popular models that I'd recommend. For a reasonably small investment you'll be able to get a ton more enjoyment from your instrument, and be able to record directly without the hassle, complication, and loudness (here's to you sleeping neighbors) of miking live amplifiers in your home studio. So if you've read this far let me make one final suggestion perfectly clear. Don't Wonder About It.... Just Go Do It. I'll be here waiting with some more witty banter for when you return. It took me a while to try it out myself, but once I did I kicked myself for not doing it sooner. Maybe you don't care about what the neighbors think. Who knows... maybe they WANT to hear your amped signal cranked to 11. Regardless of the reason, how do you record yourself direct to your computer, but still plug your instrument into an amp so that you can get the true feel of the performance? You are in need of a THRU port on your DI box. This is a parallel path that takes the inputs signal and basically copies it. Now you have 2 signals with 1 signal going to the output (and eventually to your recording interface) and the other copied signal going via the THRU on to your amp. This is useful if you are playing live with others but still want to record direct to your interface. You get the best of both worlds because you can hear yourself playing and maintain the energy of your performance, while at the same time having the flexibility to add FX, amp simulations, and anything else you want to the direct signal.